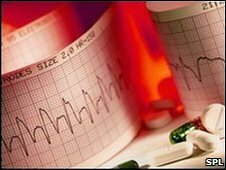 A type of blood fat different from cholesterol may play a key role in heart disease, a study suggests. Cambridge University researchers looked at the role of triglycerides, which is produced in the liver and derived from foods such as meat and dairy products. The analysis of 350,000 people from 101 previous studies found those with higher levels of the blood fat were more likely to have heart disease. But experts warned more research was needed to confirm the link. The analysis centred on a specific gene which is known to influence the levels of triglycerides, the Lancet medical journal reported. Previous research has looked into the issue, but has been inconclusive. But the latest study found those with the variation in the gene which boosted triglyceride levels had an 18% greater risk of heart disease than those that did not. Lead researcher Dr Nadeem Sarwar said the findings suggested the blood fat could be causing heart disease in some way. But he added further research involving the lowering of the levels of the blood fat was now needed to confirm the suspicion. "Such trials should help establish whether lowering triglyceride levels can reduce the risk of heart disease." Mike Knapton, of the British Heart Foundation, said: "It could yet prove to be an important step towards tackling cardiovascular disease but we mustn't get ahead of ourselves. "There still needs to be larger trials before we can know whether lowering triglyceride levels can reduce heart disease risks. "For now, people should continue to follow advice on diet, exercise, stopping smoking and medication which are still the best ways to tackle your heart disease risk." Dr Sonia Anand, of Canada's McMaster University, agreed. "The true nature of triglycerides effect on coronary risk still needs further clarification."